Troon is a delightful seaside town with views of the Isle of Arran, long sandy beaches and a yacht marina. The marina is home to Yacht Haven, one of the leading sailing clubs in the area, with ample opportunity for sailing, windsurfing and kitesurfing, as well as bracing windy walks on its expansive beaches. Troon was once a P & O ferry port with regular trips to Ireland and in the past was a leading manufacturer of small passenger boats and merchant ships. The ferries may no longer be running, but Troon still has a busy harbour and a well-known fish market, which supplies all of the local restaurants along the marina with fabulous, freshly-caught fish and seafood, as well as having an abundance of independent cafes and boutique shops. As with many other places in the local area, Troon is very well-known for its golf and has an impressive total of 7 courses to choose from, including the prestigious Royal Troon, which regularly hosts the Scottish Open Championship. Given its golfing pedigree it is hardly surprising that Scottish golf legend Colin Montgomerie call Troon his home. Here at Hog Roast Troon, we also love delighting our local diners with fantastic fresh locally-sourced ingredients in all of our dishes. 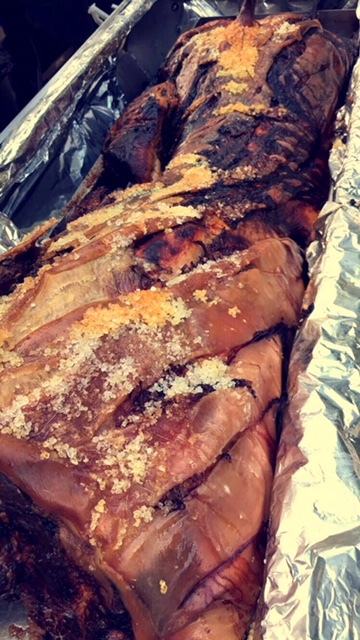 Our commitment to sourcing only the finest homegrown produce available, from our pork to our vegetables, is one of the reasons Hog Roast Troon is everyone’s number one choice for hog roast catering in the area. We use our high-quality ingredients to create imaginative menus befitting for any special occasion from regattas at the sailing club and special events at the marina, to corporate entertaining for golfers and indoor or outdoor wedding receptions with sea views. Troon is a bustling place and a great town for hosting all sorts of gatherings, and thanks to our flexible catering style and attention to detail, the Hog Roast Troon team are regularly asked to cater for numerous different types of occasions. Whilst other catering companies may have a set list of events they are capable of catering for, we are capable for providing food for any type of party in any location in Troon.